What age do I have to be to become a member? No there is no upper age limit. Do I have to have a learning disability? There is an annual membership fee which is £20 for April 19 to Mar 20, activities start from as little as £2. Do you provide 1-1 support? Do you offer a pick up & drop off service? No, members need to be independent travellers or have travel plans already in place. How many activities do I have to attend? There is no minimum or maximum number. You can choose what you do. Do I have to be a member to attend activities? How do I pay for activities? Do I have to pre-book activities? Can I just book the holiday? No. You must have attended 12 activities from April of the previous year to the holiday application close date. This is usually sometime in February. What is your volunteer/member ratio? There is no set amount of time, you pick the times that work around your other commitments. No we will pay agreed expenses. There is an induction period of 5 activities. Relevant training will be made available to you. You will be asked to attend an informal discussion with our Organiser. Will I need to give references? If you require a reference please do ask. For more information on the above and if you live in the Stevenage or North Hertfordshire area, please Contact Us or telephone using 01462 485534 and we will be glad to answer all of your questions. 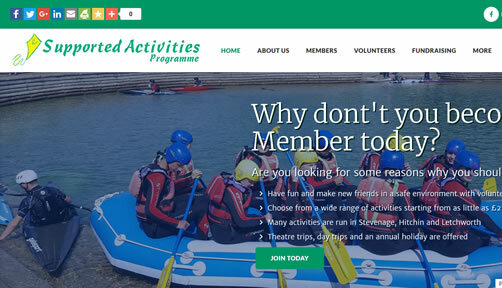 Alternatively, for more information on becoming a member of Supported Activities Programmme, please visit our Members section, or visit our Volunteers section if you would like to become a volunteer. We could not run without volunteers and there are various roles available.